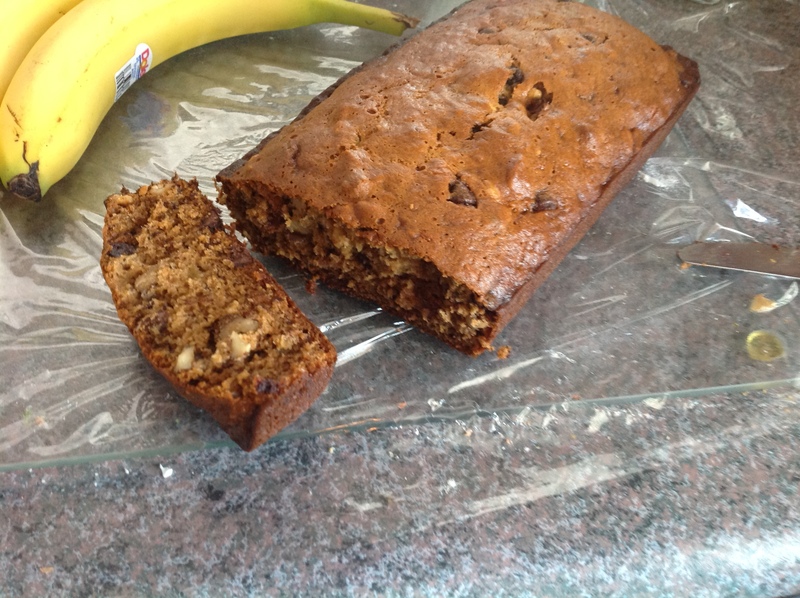 Bananas for Baking – Trying out new recipes, old recipes, and some of my own. We always have bananas on hand. Always. I don’t think we ever come home from the grocery store without bananas. And we always have Nutella, because well, Nutella! I haven’t baked anything the last couple of weeks, so we’ve been out of things to munch on. 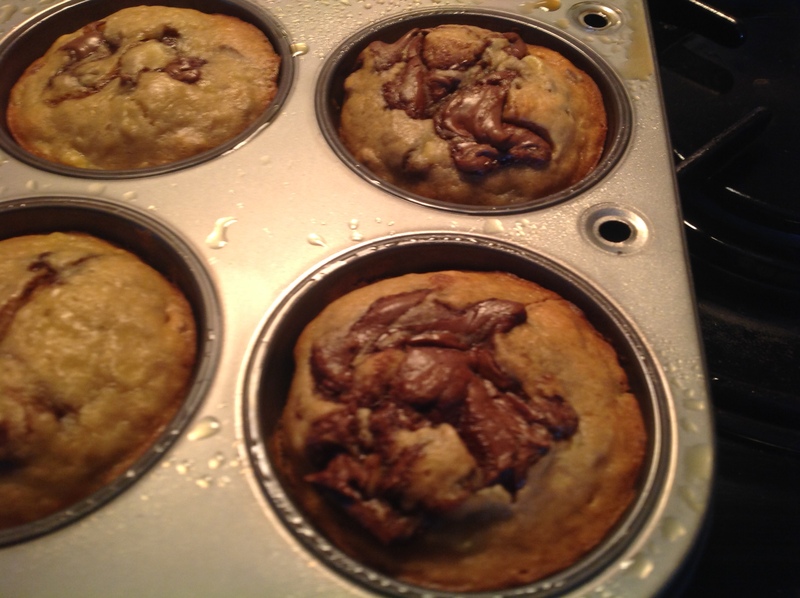 So why not combine some of our old bananas and some of that Nutella to make muffins? These came out great. I didn’t do such a great job swirling the Nutella, but that worked out to my delight. They had like a big clump of Nutella in the middle. It’s like a gooey chocolatey surprise. Preheat oven to 350°F. Grease muffin pan or line with paper liners. In a medium bowl, whisk flour, baking soda, baking powder and salt until well combined. Set aside. In large bowl, whisk together banana, sugar, brown sugar. Beat in egg, vegetable oil and vanilla extract. Slowly whisk in the flour mixture, until there are no lumps. Fold in pecans. Fill muffin tins 3/4 full (about 1/3 of a cup of batter). Top each muffin with about 1 teaspoon of Nutella and use a toothpick to swirl it into the batter. Bake muffins for 15-17 minutes, or until a toothpick inserted in the center comes out clean. Serve warm or store in an airtight container until ready to serve. I may be the world’s pickiest dessert eater. When it comes to chocolate, I cannot stand for it to be anything less than 60% cocoa. No milk, no white, nuhuh, no way. And when it comes to brownies, they had better be nice and dark and rich and ooey gooey. And of course, they had better not have nuts in them. They can have a fudgy frosting on top with nuts but they cannot be in the brownie. So here I have found the best dark, rich brownies I have ever had. 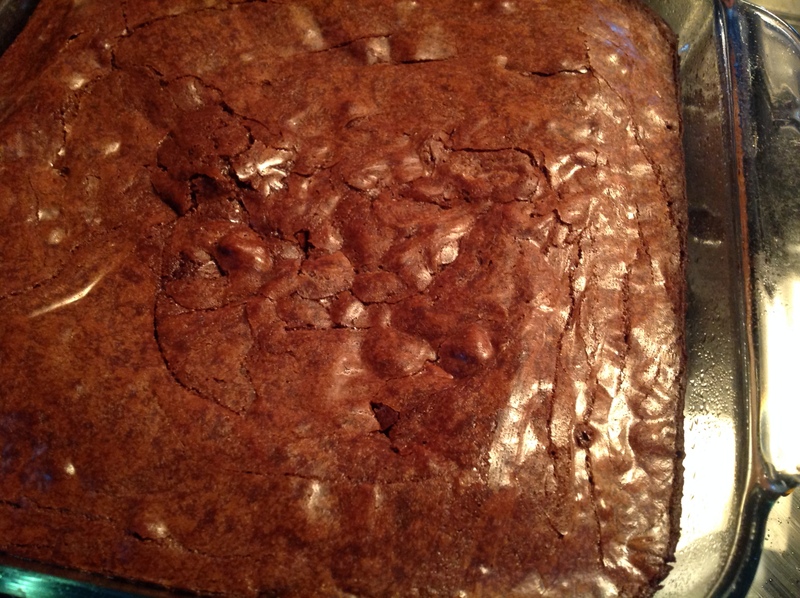 These brownies can be made in an 8″x8″ pan or a 13″x9″ one. The directions are for a 13″x9″ pan. If you make them in a square pan like I did, up the cooking time to about 50 minutes. Brownies are so versatile. Sprinkle some powdered sugar on them or serve them fudgie-budgie style with ice cream, chocolate sauce, and whipped cream. If you’re like me, you may have forgotten the cocoa powder altogether. Whoopsie. Don’t worry. They still taste just fine. Preheat the oven to 350°F. Grease a 13″x9″ pan. In a medium/large saucepan, melt the butter and unsweetened chocolate over low heat. Stir occasionally until smooth and melted through. Sprinkle in cocoa powder and whisk to combine. Remove from heat and let cool. Stir in the sugar and vanilla until just combined. Stir in the flour until halfway incoroporated then add the chocolate chips. Bake for 40 minutes, or until a toothpick comes out clean. Save your corner pieces for me! 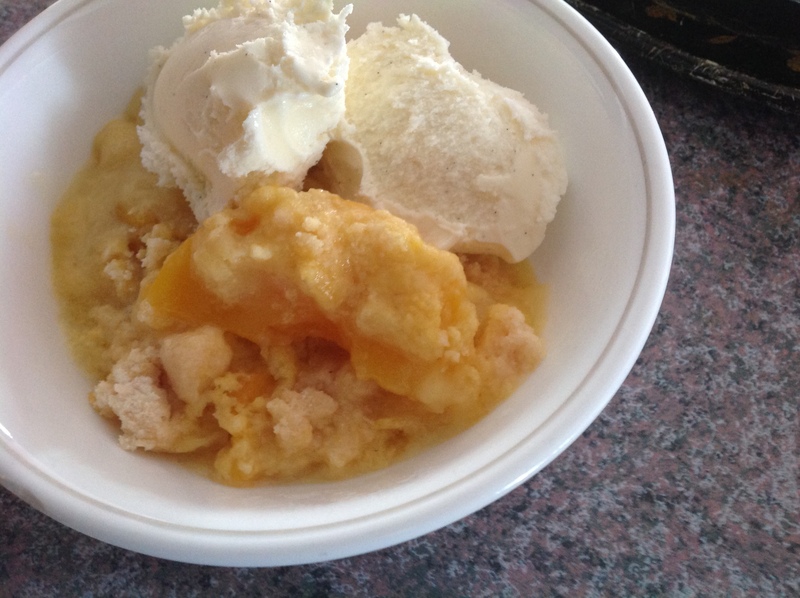 This is the world’s easiest peach cobbler. I like to call it The “MacGyver” Recipe. It’s so easy and addicting. And of course, it’s always best when served warm and a la mode. You don’t have to drain the peaches. It has a more soupy consistency then but still just as tasty. If you don’t like peaches, this works very easily with any kind of fruit: fresh, frozen, or canned. Drain the canned peaches and place into a 9″x13″ cake pan. Layer the cake mix on top of the peaches. Melt the stick of butter and pour evenly onto the top of the cake mix. Bake for 35-45 minutes, until the top is golden brown. Happy Pi Day, folks! Yes, today’s date is 3.14. 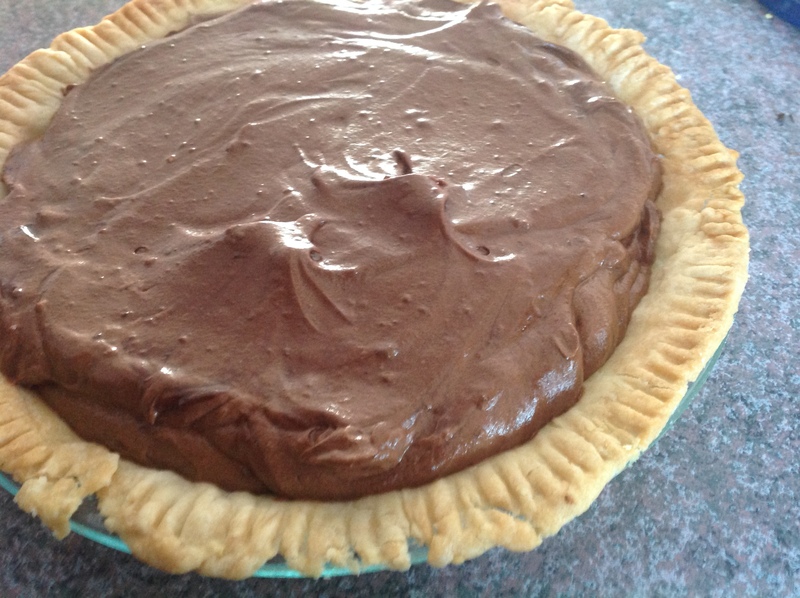 And what more reason does a little math-centric girlie like me need to make a pie? I have never made a whole pie from scratch before. I have made a pie crust once in my entire life and that time I used a canned pie filling. Usually, I just buy pie crusts and then make the filling from scratch. Today, however, I felt the need to challenge myself. When I started trying to decide what to make for Pi Day (like three weeks ago), I had a Certain Someone make an ordered list of his favorite kinds of pie. Of course, french silk was the top one, chocolate lover that he is. I researched different recipes and narrowed it down to two different ones. I liked the traditional crust recipe in the first and the filling recipe in the second. So I decided to combine the two. So celebrate today. Bake a pie. Watch The Life of Pi. And remember, the circumference of your desert is 2πr. For me, it took about 6 TBSP of water to form the crust. Also, the time it takes for the crust to cool is about how long it takes to make the filling. Don’t eat too much of the chocolate! Cut the shortening into the flour and salt using a pastry cutter (or a fork if you don’t have one like me). It will be really crumbly. Add 1 TBSP of ice water at a time and mix until the dough forms a ball. Roll out the dough and place into a pie dish. Crimp the edges using your fingers or a fork. Dock the dough several times in the bottom and the sides using a fork. Place some parchment paper on top of the dough and fill with dry rice, beans, or pie weights if you have them. Cook the pie crust in the oven for 15 minutes. Remove the parchment paper and weights and cook the crust for 10 minutes longer, or until it’s golden and flaky. Pour the heavy cream into a large mixing bowl and whip on medium-low speed until foamy, about 1 minute. Increase the speed to medium-high and continue to whip until stiff peaks form, 2 to 4 minutes. Transfer the whipped cream to a small bowl and refrigerate until needed. Place the chocolate in a microwave-safe bowl and microwave on 50% power in 30-second increments, stirring after each, until completely melted and smooth. Set aside. In a large, heatproof bowl, whisk together the eggs, sugar and water. Beat the mixture on medium speed until pale yellow and thick, about 5 minutes. Set the bowl over a medium saucepan filled ½-inch of barely simmering water over low heat, and warm the mixture, stirring occasionally, until it reaches 160 degrees F on an instant-read thermometer. Remove the bowl from the heat and beat the mixture on medium speed until it is light and fluffy and cooled to room temperature, about 8 minutes. Add the melted chocolate and vanilla extract to the cooled egg mixture and beat until incorporated. Beat in the butter, a few pieces at a time, until well combined. Using a rubber spatula, fold in the whipped cream until no white streaks remain. Scrape the filling into the pie shell and refrigerate until set, at least 3 hours or up to 24 hours. Serve with fresh whipped cream. I am not a big fan of “sweet” breakfast foods. Even though I will make them and eat them, I never choose to eat pancakes or waffles. Give me some toast or some eggs. But muffins, I’ll make an exception for muffins. A muffin and a cup of tea is a good way to start any day. Usually, I’ll just settle for store bought muffins, but homemade is always a better way to go. 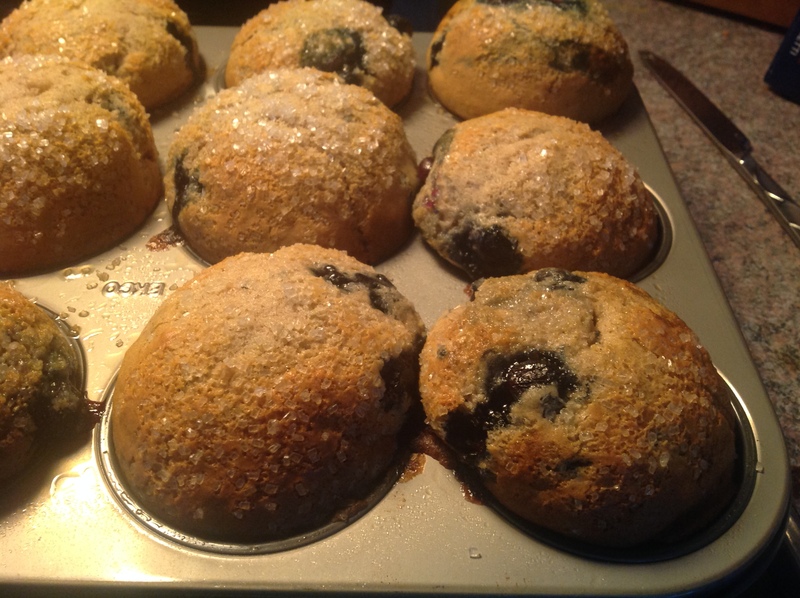 I’ve tried a few different recipes for blueberry muffins, but this one is my favorite so far. The cinnamon makes all the difference. Make sure to keep in mind that this recipe is set up for jumbo sized muffins but includes adjustments for standard sized and mini ones. The recipe says you can make 15-16 standard sized muffins. I made 12. It made some of them extra “dome-y” but they still taste great. Simply leave them in at 375 for a couple of extra minutes. Muffins are like pancakes – don’t overmix them. Everyone loves snickerdoodles. And no, I don’t just mean that everyone loves my cat. I’ve been making these cookies for longer than I remember and it’s one of the few baking recipes I know by heart. They’re simple to make and light and fluffy. In my opinion they’re much better than sugar cookies. They’re so much less work and the texture is much lighter. P.s. Don’t worry, bestie. I’ll mail you your own batch later this week! Snickerdoodles usually have a cake-like texture on the inside, but if you’re looking to cut calories, using splenda or another sugar substitute gives them more of a muffin-like texture. 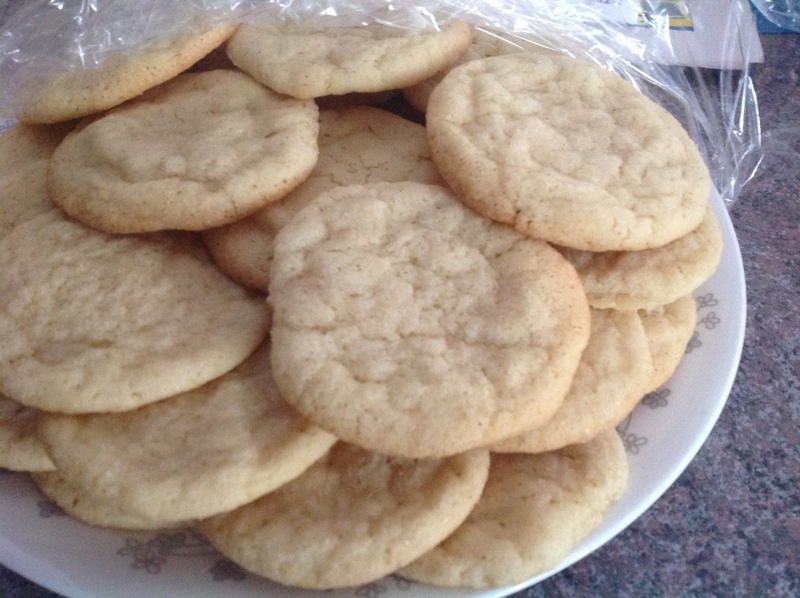 Bake the cookies only until the edges are set, so that they retain their softness. Baking them longer will result in hard crunchy cookies. I like mine a little extra cinnamon-y. For the sugar-cinnamon mix, I usually add about 2 tsp of cinnamon. Preheat oven to 350°F. Place parchment paper on a cookie tray and place it in the fridge to cool. 2. Mix the flour, cream of tartar, baking soda and salt in a bowl. Set aside. 3. Beat together the butter and the sugar using a mixer until fluffy. 4. Beat in the eggs one at a time. Add the vanilla. 5. Slowly add the flour mixture and mix just until it disappears. 6. Cover the dough and chill until it is set. This takes about 30 minutes. 7. Mix together the sugar and cinnamon. 8. Roll the dough into 1 – 1 1/2 inch balls. Roll the dough balls in the sugar and cinnamon. Bake them for about 10-12 minutes, until the edges are set. 9. Chill dough and cookie sheets between batches. 10. Let cookies rest on the baking sheet for about 3 minutes. Then let them cool completely on a cooling rack.